The school was originally in Grant town. School was 8 months long. Enrollment in 1890: 13 students. In 1898: 19 students. School was first held in 1890 in Mr. Hans Johnson’s house. A school was built the following year in a natural oak grove. Another school was later built somewhere else to accommodate more students and the old school was sold, and became a first and second grade school while the new school house grades 3-8. 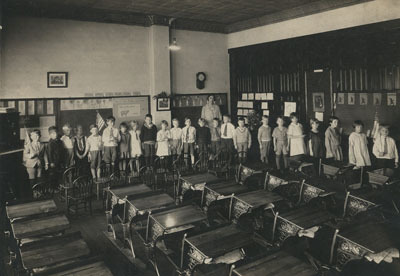 In 1930, the high school was built and grades 5-8 went there for classes. Other teachers: (before 1898): Ethel French, Mary Betaque, Jennie Hanson. (after 1898): Ellen Simmons (20s), Lenore Peters (20s).